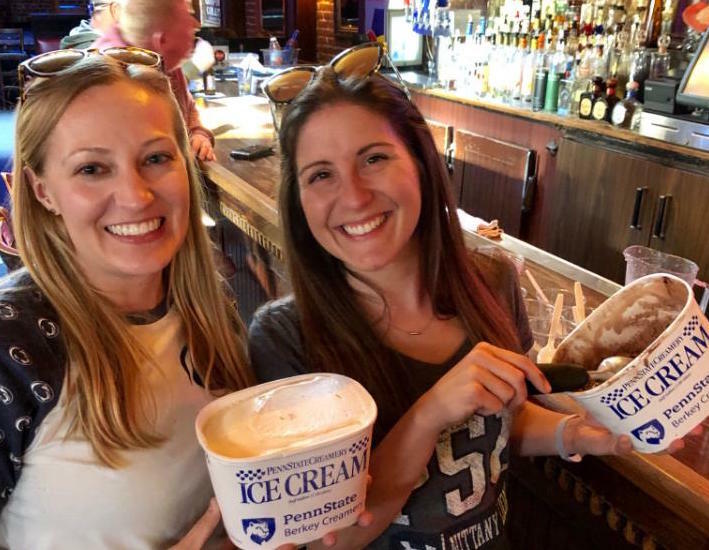 Each year we ship Penn State Berkey Creamery ice cream to Orange County to celebrate the end of the football season and to bring a bit of Penn State closer to our local alumni! We had a wide variety of flavors to choose from including fan favorites Alumni Swirl, Bittersweet Mint, WPSU Coffee Break, Peachy Paterno, Peanut Butter Swirl, Death By Chocolate, Keeney Beany Chocolate, and a special seasonal flavor Apple Cobbler Crunch. The entire crowd, including our waitstaff at JT Schmid’s enjoyed sampling the flavors! In fact, one staff member mentioned he had seen the Creamery featured on TV, but never got the chance to try it until our gathering! 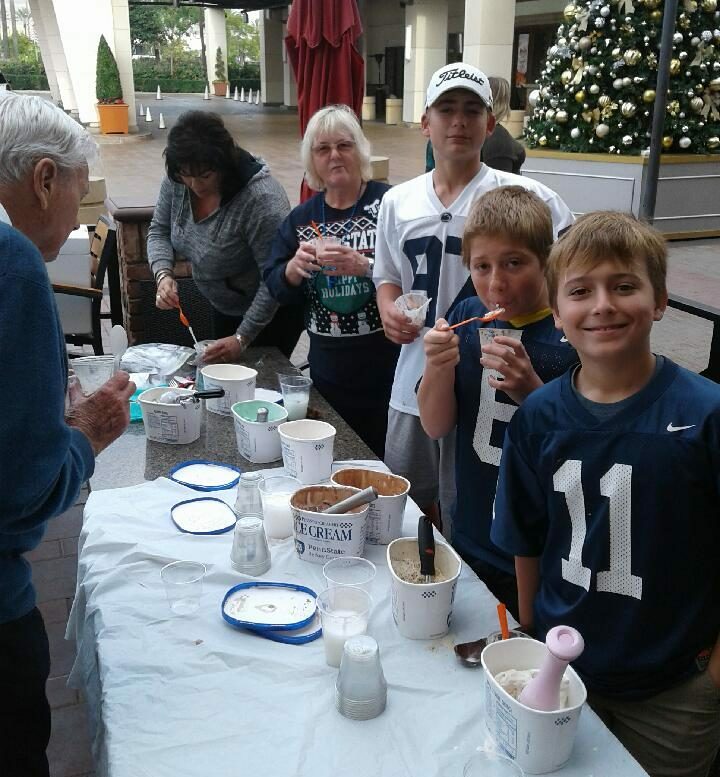 At JT Schmid’s, Patty Messner joined the Wolfe clan (Grandma Judy, Mason, Sawyer & Parker) in dishing out some Alumni Swirl to Treasurer Bob Hunter. BIG THANKS to JT’s for their generous $25 gift cards used for raffle prizes and for always going above and beyond in serving our needs. I think they will miss our boisterous blue & white crew waking them up on Saturday mornings! 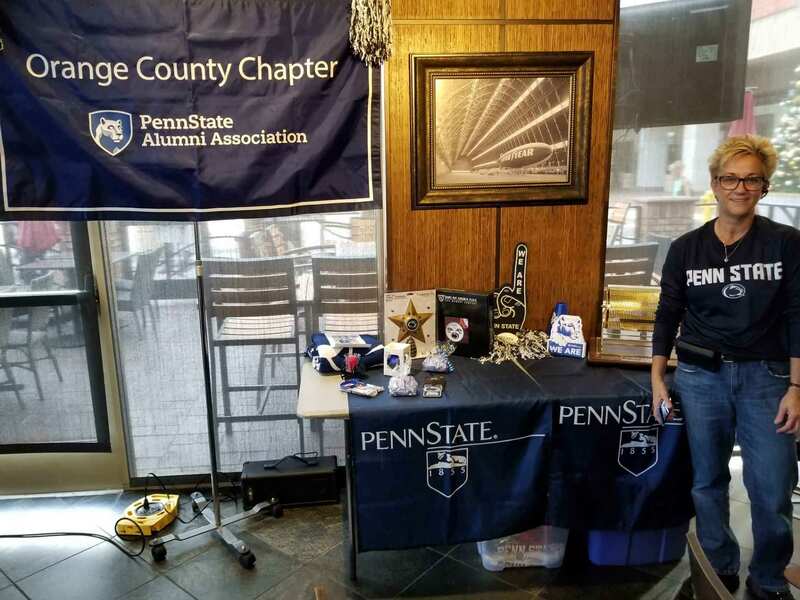 Chapter President Michele Trasport-Gonzalez wowed us all season with creative and fun Penn State raffle prizes saving the holiday themed ones for our last gathering. Six alumni attended ALL of the games this season and were entered into a special raffle. Movie buff Dom Saltarelli was the big winner of a Fandango gift card and popcorn…word has it that he attends movies once a week, so it was the perfect prize! Terry Brennan and Judy Wolfe are looking festive already anticipating our annual Holiday “Mix & Mingle” event on December 11th. The women loved Judy’s paw Ugg boots! 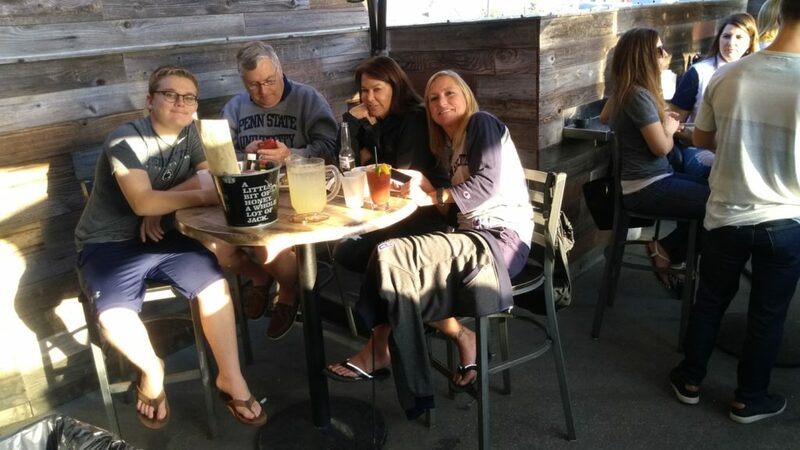 Meanwhile, at the Blue Beet, we had dozens of members viewing Penn State vs. Maryland on every level while enjoying Peachy Paterno and Death by Chocolate Creamery ice cream. One of our long-time Chapter members, Stephanie Hart assisted Co-VP Carol Kacer in making sure everyone had a treat! 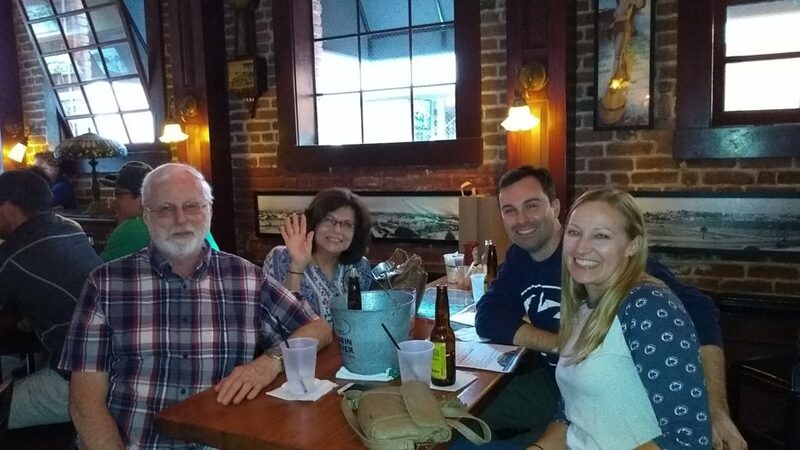 The Quayle family joined us, as well as the Simpsons, the Harts, and some other out of towners like John Shaffer from the Vegas chapter. 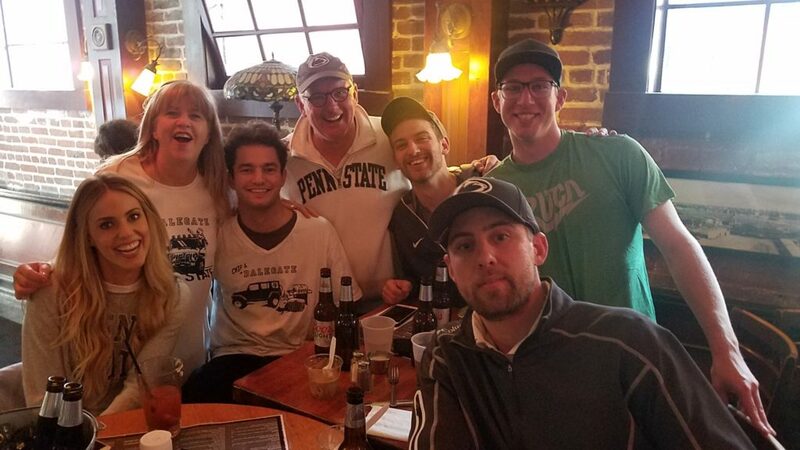 We all went home in good spirits from not just the sugar rush, but also from experiencing a final Penn State victory against Maryland (38-3) to end the 2018 season on a high note. We look forward to seeing you all again at our Holiday Mix & Mingle networking event and holiday party, as well as our Bowl game gathering! 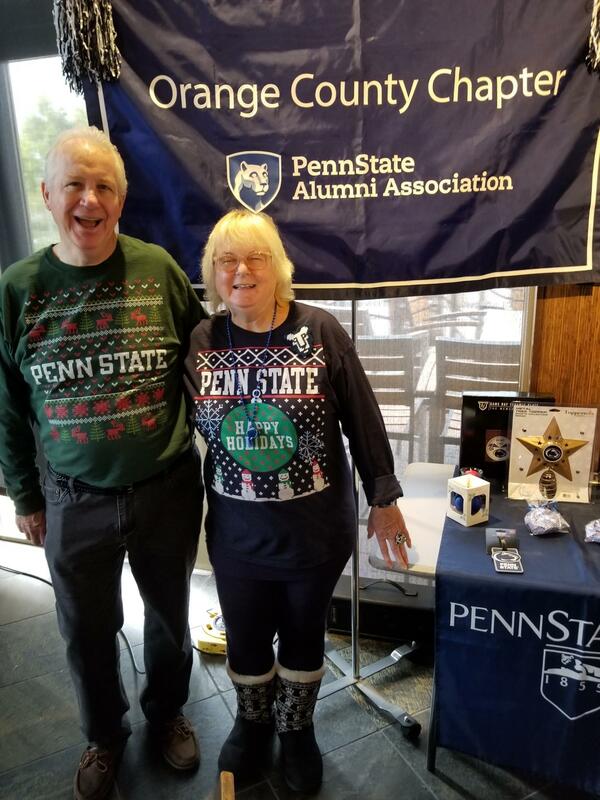 Copyright © 2018 Orange County Penn State Alumni Association. All Rights Reserved.